Home > Features > #OnsitegoCares Contest Is Now LIVE! #OnsitegoCares Contest Is Now LIVE! The #OnsiteGoCares contest is now open to all on Twitter and Facebook. 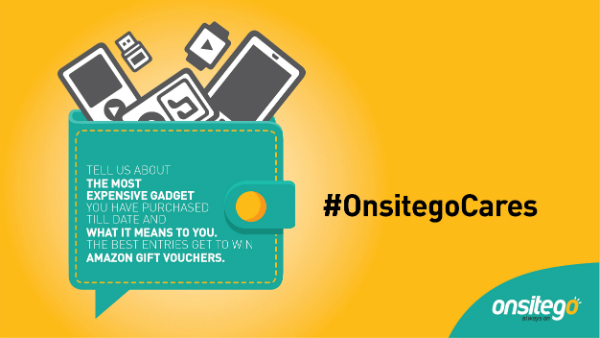 1) Follow @OnsiteGo and respond to the contest question with #OnsitegoCares added to your tweet. 2) Entries without the #OnsitegoCares will not be considered. 3) Your followers count does not matter to us. All we need is 2 interesting and original entries that WE love the most. 4) The contest is open only to residents of India. The 2 best entries we choose get to WIN an Amazon voucher worth Rs 1,500 each.